Whole Wheat Gingerbread Date Cookies - Now....you're cooking! 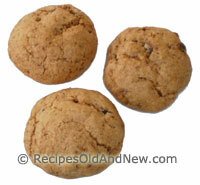 This is a healthier choice as far as cookies go, and they are very moist and tasty too. Place dates in a small bowl and pour boiling water over. Set aside to soak. Meanwhile, in a large bowl, combine flours, baking soda, ground flax seed, baking powder, baking soda, ginger, cinnamon, nutmeg, cloves and salt. In another bowl, combine egg, brown sugar, molasses and butter. Add dates and water to this mixture. Make a well in the dry ingredients and pour in the liquid ingredients, stir to combine. Refrigerate the dough for about an hour until firm enough to roll. Place balls 2 inches apart on greased baking sheets, and bake at 350 degrees F. for about 10 minutes. Cookies should still be soft to the touch. Remove from pan to a baking rack to cool. Makes about 40 cookies.